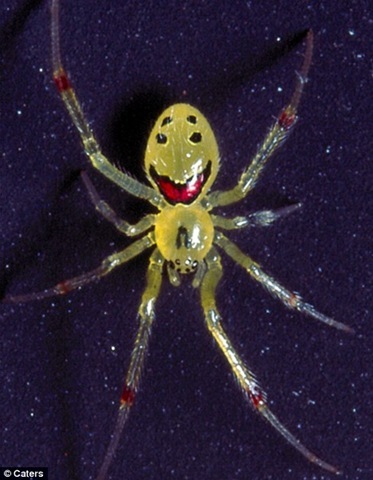 A freak of nature, this amazing spider was found in Hawaii, measures just a few millimetres across and a bizarre marking which looks just look a smiley face. The spider itself is harmless to humans and scientists believe the pattern serves to confuse predators. But it’s no laughing matter for the spider which is under-threat from extinction from its home in the rainforests of the Hawaiian island chain in the Pacific ocean. Lets hope this little guy can spread some cheer and lives a long, happy spider life. This entry was posted on Saturday, April 25th, 2009 at 12:57 pm	and is filed under Funny, Odd & Bizarre. You can follow any responses to this entry through the RSS 2.0 feed. You can skip to the end and leave a response. Pinging is currently not allowed.